This past weekend I read an article in the local newspaper about a race taking place in Ohio…and the winners could take home trillions of dollars. Want to get in? You’ll need a heavy-duty drill rig and the equipment necessary to install a well capable of recovering natural gas from over 5,000 feet below the surface. Recently, there has been a large amount of interest in the exploitation of the Marcellus Shale, located at depths of over a mile beneath the surface, was once believe to hold approximately 1.9 trillion cubic feet of natural gas (2002 estimate by USGS). This volume, while seemingly significant, would have translated to fairly low production per wellhead due to the entire volume being spread over the enormous geographic extent of the shale formation…not enough to justify the cost of well installation. In 2003, Range Resources – Appalachia, LLC stumbled upon a gold mine – of sorts. Their well installed in Washington County, Pennsylvania produced a respectable flow of natural gas. 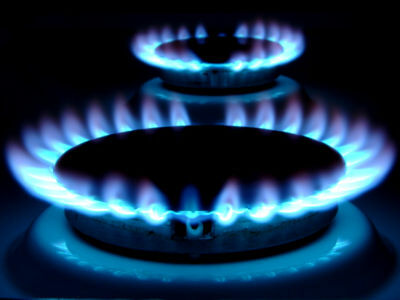 With the Marcellus Shale’s natural gas in the eyes of the energy industry once again, new estimates in early 2008 revealed a shocking surprise. This geologic formation may be the holding cell for up to 500 trillion cubic feet of natural gas below parts of eight states in the Eastern U.S.. While only about 10% of the gas is considered to be recoverable, this is enough to supply the needs of the entire U.S. for two years, with a potential value of 1 trillion dollars for each producing wellhead. Now, a multitude of companies in the natural gas industry are looking for mineral rights on the land overlying the shale formation. Companies have been approaching land owners with offers ranging between – and potentially exceeding – $300 and $1,600 per acre for their land, and the usual 12.5% royalties on any gas produced (Ohio figures). They’re certainly expecting a lot of gas! In order to reach the Marcellus Shale, companies will have to drill a vertical hole through over 5,000 feet of rock. At this point they may have reached the shale, the drilling operation must change direction…literally. At this point the borehole is drilled horizontally within the shale formation. Along the horizontal path, the company will use technique to induce fractures within the shale which act as conduits for the natural gas to easily flow into the borehole and be extracted through the well installed within. 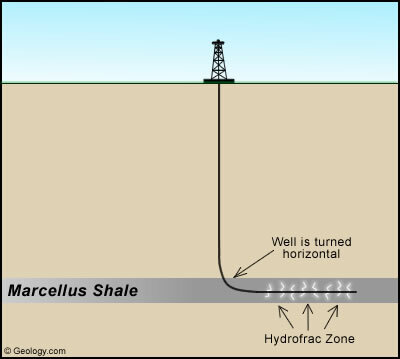 This technique is referred to a “hydraulic fracturing” (nicknamed hydro-fracking or just fracking). I previously described this process in the third paragraph of my post titled Paint it Black: Oil in the Gulf which I suggest as supplementary reading (of course). For now, the process involves injecting fluid and sand into the borehole under enough pressure to literally cause the surrounding rock to crack – e.g. the term “hydraulic fracturing”. The sand serves to fill in the fractures and keep them from closing up later. Like most gas and oil reservoirs, natural gas forms as a result of organic material trapped within the rock (once again, you can read a little more about this process in the above-mentioned post). In this case, the Marcellus Shale’s organic material originated in the Middle Devonian period between 398 to 392 million years ago, while the area we know as Ohio (and many of the surrounding states) made up the floor of a shallow sea. As silt and clay sediments settled to the sea floor, so did the remains of tiny plants and animals, eventually becoming buried in more sediments. Over time – millions of years – the sediments become rock in a process called lithification. This process not only traps the organic matter within the rock, but the pressures and temperatures involved result in a breakdown of the organics into gas and, if conditions are right, oil. While Ohio does produce a large amount of crude oil (over 5 million barrels in 2009 and one of the top producers in the country), natural gas is what makes the Marcellus Shale so intriguing to the energy industry. In fact, Ohio already a large producer of natural gas, sixth in the nation with over 88 billion cubic feet produced annually. As if the Marcellus Shale wasn’t enough, according to the Ohio Department of Natural Resources, the even deeper Utica Shale (8,000 feet) could prove even more fruitful than the Marcellus. For now, all eyes remain on the Marcellus Shale and all it has to offer. For more information about the Marcellus Shale and natural gas production, as well as environmental impacts and economic benefits that come with exploitation of these resources, try reading this article on geology.com and the newspaper article that called my attention to this subject. Obviously, there are many more sources of information out there, so do some exploring on your own, too…but don’t forget to share this article while you’re at it (look below)!